Lots of old-school Indiana mountain bikers like to tell tales about riding at Gnaw Bone Camp in the 80's and 90's. It has always been a place that has welcomed mountain bikers. 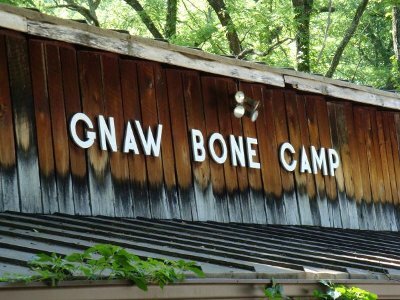 Gnaw Bone Camp is a privately-owned, long-standing summer camp for young girls. Several generations of young women have attended camps here. Because it is primarily a camp first and a riding destination second, there is no riding allowed there during June and July when camps are in session. Gnaw Bone Camp is 1560 acres in size, and it has approximately 25 miles of mosty un-groomed singletrack and some old fire roads. The trails form a spider-web network of trails that can be somewhat difficult to follow. You'll need a trail map or even better yet a local guide to lead you on the best routes. You might get turned around or lost a few times, but if you don't mind a bit of backtracking or adventure you'll enjoy yourself. Locals try to keep the trails free of deadfall and large debris, but the trails are backcountry-style and rougher than the trails at Brown County State Park. The land is heavily wooded and scenic. Some trails are very technical with steep, technical climbs and descents. The riding level is intermediate to advanced. Trails are closed in wet conditions. Please check the trail conditions forum first. Call (812) 988-4852 for information or to see if the Camp is open for mountain biking. Riding hours are dawn to dusk. Please do not bring your dog to Gnaw Bone Camp. There are usually a lot of dogs, cats, roosters and other animals that will greet you upon arrival! Alice Lorenz, the owner of the camp, is a very gracious and friendly host. It has always been just $3 to ride the trails. eXplore Brown County borders Gnaw Bone Camp but you cannot cross freely from one property to the other. From State Highway 46 (between Nashville and Columbus) take State Highway 135 south about 2 miles just past Shepherd Road to Gnaw Bone Camp. Look for the small, wooden "Gnaw Bone Camp" sign. Turn left (east) into Gnaw Bone Camp and park near the old, large building which is known as the "General Store". Look for Alice or one of the other Gnaw Bone folks near the General Store to pay your riding fee and sign your waiver.